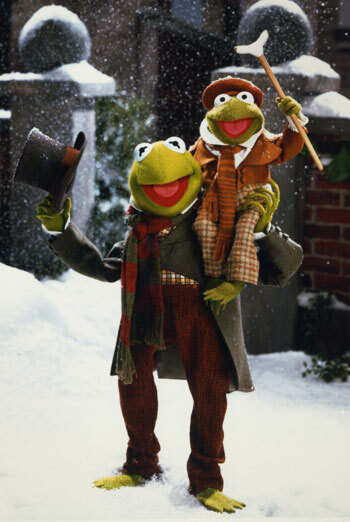 THE MUPPET CHRISTMAS CAROL is an adaptation of the story by Charles Dickens in which a curmudgeonly miser is visited by three ghosts who teach him the meaning of Christmas. Mild scary scenes occur as Scrooge is visited by spirits, including his door knocker turning into the disembodied head of an old business partner and a tall, silent, hooded and faceless ghost who directs Scrooge to a vision of his own grave. In another scene tension builds as Scrooge sits alone, becoming frightened by strange noises, before two ghosts appear hovering before him. However, none of these spirits mean any harm to Scrooge, rather their intention is to help him. Their appearance is also accompanied by comic moments involving either the ghosts or other characters. Occasional sad moments include a vision of the future in which a kind young boy has died, upsetting his family.